Anticipation continues to build as Taber braces itself for the Coors Banquet One Horse Town concert coming this Saturday to Confederation Park. “The excitement continues to go up. It’s been a few weeks since the tickets were made available, and so it naturally happens leading up to the actual concert,” said Jessica Teixeira, manager, brand public relations for Molson Coors. 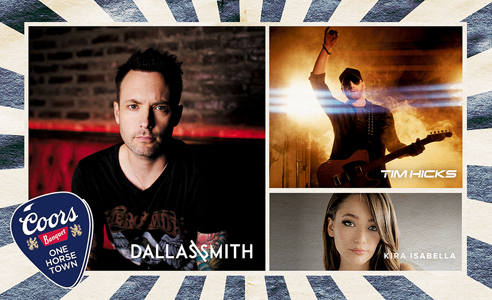 Dedicated voters in the southern Alberta region made Taber the 2018 winner of the Coors contest for a concert that will showcase Canadian country stars Dallas Smith, Tim Hicks and Kira Isabella. Coors Banquet One Horse Town is a national search for Canada’s proudest small town with a big passion for country music. Wanting to get fair and equal representation from across Canada, Coors Banquet picked small towns from coast to coast for consideration. The other five towns joining Taber on the list of finalists were Miramichi, New Brunswick; Portage la Prairie, Manitoba; Napanee, Ontario; Nicolet, Quebec; and Williams Lake, British Columbia. Tickets were snatched up in mere minutes as Taberites logged in on their computers, issuing their postal codes for a chance at free tickets in late August. The concert will go rain or shine on Saturday at Confederation Park with doors opening a 6 p.m. with the first act beginning at 7 p.m.
Once a patron has passed the doors and are in the concert area, they cannot leave and come back in as the ticket can only be scanned once. The concert is expected to wrap up at around 11 p.m. where there is no assigned seating. Three food vendors have been confirmed for the One Horse Town Concert in Mediterranean Grill, Boston Pizza and Di’s Dinner with food trucks as no outside food and beverage will be permitted. To ensure maximum enjoyment of the concert for party goers, no furniture of any kind, coolers, umbrellas, pets or other large items will be permitted. The selection of Confederation Park and its centralized, wide-open space actually made for more tickets being available than last year’s winner in Moose Jaw, Saskatchewan, despite being nearly four-times larger in population base. There will be road closures in Taber the day of the concert on Saturday, in 50th Street, from the north side of 48th Avenue, up to 50th Avenue. Also on 50th Avenue, east and west from 48th Street to the east side of 50th Street. Finally, on 50th Avenue, there will be a barricade blocking traffic, but allowing local traffic to pass with residences. “It may inconvenience a few folks that day, but hopefully not that much,” said Teixeira. Wanting to be a responsible corporate partner, with alcoholic beverages being sold at the venue the night of the concert, Molson Coors has made available a shuttle service to take people to and from the concert, discouraging people from drinking and driving. Pick up will run from 4-7 p.m. on Saturday and departure from the venue will run from 10:30 p.m-12:30 a.m. Three bus loops will be running, hitting five stops. The list of stops include; 50th Avenue at the opening of Westview Gate; 53rd Avenue and 48th Street (St. Patrick School Area); 50th Street and 60th Avenue intersection; 54th Avenue and 54th Street intersection and 42nd Avenue and 53rd Street intersection (L.T. Westlake School area). For a full list of frequently asked questions about the Coors Banquet One Horse Town Concert, log onto coorsbanquet.ca/-/media/molson-coors-canada/mcb/oht/Concert-FAQs-One-Horse-Town-Taber-AB.